Science Careers: The Good, the Bad and the Starry | O'Really? Of all the things you can do with a Science degree, being paid money to stargaze from the top of a volcano in Hawaiʻi has to be one of the more interesting. Tom Kerr is one such lucky astronomer who has been managing operations at UKIRT (UK infrared telescope) – currently the world’s largest telescope dedicated solely to infrared astronomy . So what is it like working more than 4000 metres* above sea level, near the summit of Mauna Kea on the big Island of Hawaiʻi? Can you imagine filling your days and nights observing the glorious majesty of the night sky, amazing sunsets and sunrises interspersed with surfing sessions on the beach? Tom’s blog A Pacific View documents what Hawaiian life can be like. 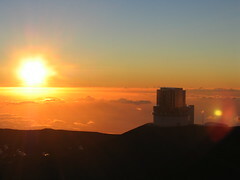 A recent post things I’ll miss (and others I won’t) describes the good, bad and starry parts of astronomy in an exotic location. There is also an accompanying set of rather stunning pictures on Flickr. So if you’ve ever wondered what it’s like to be involved in stargazing for a living, Tom’s blog and photostream tells you more.